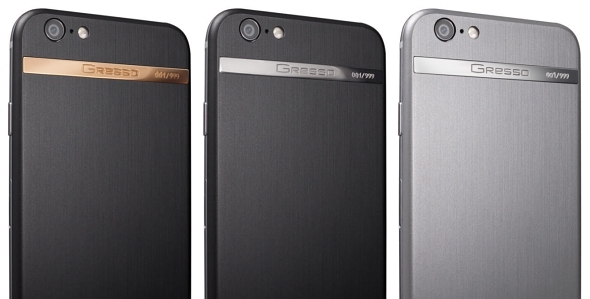 Gresso, the US company that become famous for its luxury mobile devices, has now decided to stud into Apple territory. The latest piece of opulent tech it added to its portfolio is the iPhone 6, but a version complete with exclusive materials, like titanium and 18K gold. 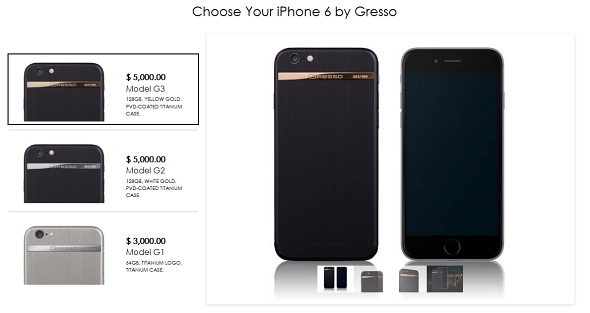 The iPhone 6 by Gresso bears pretty much the same visual style as the manufacturer's recent Regal Android line and also employs most of the same materials and crafting techniques. Looking at the photos, most of the customization on the Apple device has been done to the back, while the front glass and button have been left unchanged. The phone comes in three hand-crafted flavors. The G1 features a titanium case and 64GB of onboard memory, while the more-expensive G2 and G3 have a black PVD coating and 128GB of storage. All three feature an engraved logo and unit number, ranging from 1 to 999 for each of the models. In the G1 it is placed on top of a titanium plate, in the G2, it is made of 18K white gold and the G3 gets it in yellow gold. Gresso refers to the design as "Luxury Minimalism" and frankly, we have seen a lot weirder and questionable attempts at bringing luxury to a handset. The US company also boasts improved durability in the handcrafted devices. Directional polishing is courtesy of a single craftsman and upwards of 4 hours of manual labor. Naturally, the price tags are quite beefy. The "budget" G1, void of gold and PVD is priced at $3000, while the G2 and G3 come in at $5000. The phones are already available on the manufacturer's website, so high-rolling Gresso fans can now opt for an iOS device as well.